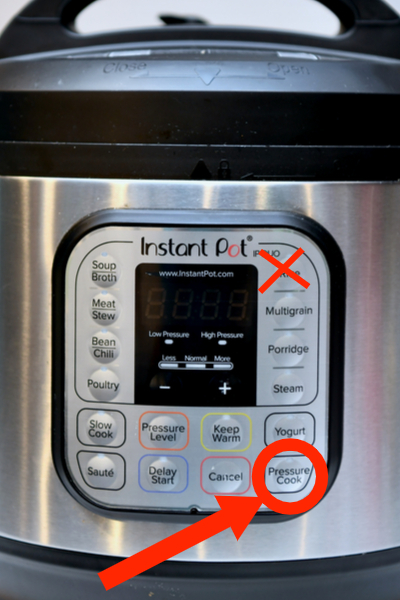 When I first purchased my Instant Pot multi-cooker, I was super excited about the thought of making white rice with just a push of a button. Not to mention, I could save space in my cabinets by getting rid of my rice cooker. Perfectly cooked Instant Pot White Rice. I eat rice at least 2-3 times per week and have tried to make it several ways with varying results. The stove top process works well but it requires constant attention. First of all you have to wait until the water begins to boil. And then you have to watch carefully so that the bubbles that the rice produces don’t spill over the sides of the pot. If that happens, then you have to spend extra time cleaning up the mess. Not fun at all! Stove top rice requires constant attention. And finally you have to let it sit and absorb the remaining water before you can finally eat. If watched carefully, the rice turns out perfect. But who has time for that? So many years ago I purchased a rice cooker to make life easier. It took a little getting used to, as the water ratio was different than the package instructions. Also my rice cooker came with a special measuring cup that you were supposed to use to measure out the rice. As much as I attempted to store it with my rice cooker, I could never seem to locate it when needed. Cleaning the rice cooker required a lot of elbow grease. But I quickly figured out how to use it and the rice turned out perfect every time. However, there were two things that I didn’t like about owning a rice cooker. One, the clean up process wasn’t as easy as I anticipated. Little grains of rice would stick to the pot and required some hard elbow grease to remove. And as mentioned before, it was just another single purpose appliance that took up space in my cabinet. But that all changed when the Instant Pot showed up in my kitchen. I would have to say that we make white rice the majority of the time in our house. Long grain white rice is perfect for cooking in the Instant Pot. White rice cooks faster than brown rice, and I actually prefer the taste of it over brown rice. I typically use Jasmine, Basmati or long grain rice when the recipe calls for rice to be served alongside the dish. The only time that I use brown rice is when I am making a one pot meal like our Healthy Chicken and Rice recipe. The beauty of making rice in the Instant Pot is that it cooks so fast, and is truly a fix and forget it type of dish. But there are a few tricks to make sure you get light and fluffy rice. Rice contains a lot of starch. This is what causes it to bubble up on the stove. 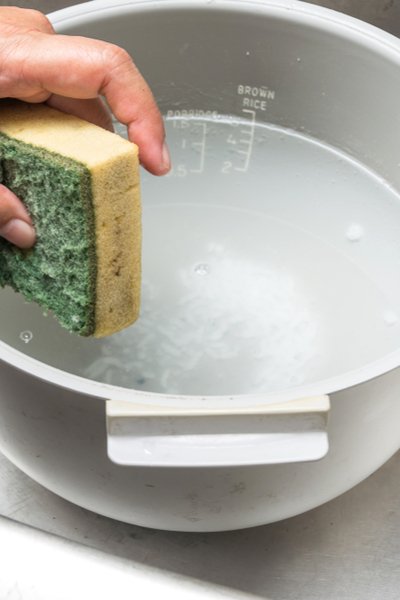 When making rice be sure to rinse it until the water comes out clear. The starch needs to rinsed off to make sure that it cooks properly. 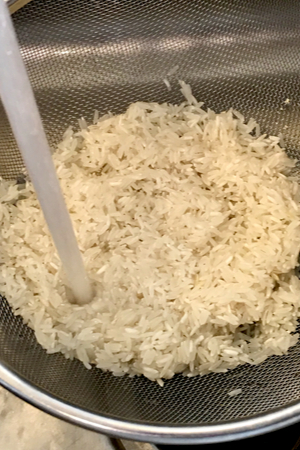 We use a fine mesh strainer and rinse the rice until the water below comes out clear. This will take several minutes. 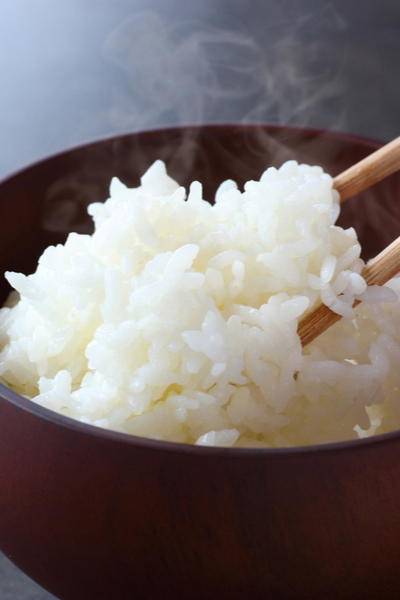 In order to make sure all of the starch gets removed, swirl the rice around with your fingers. This will allow the grains at the bottom of the strainer to be rinsed as well. The lack of consistency in texture is one of the biggest complaints when cooking rice in the Instant Pot. Some of the rice will be mushy and other grains will be crunchy. 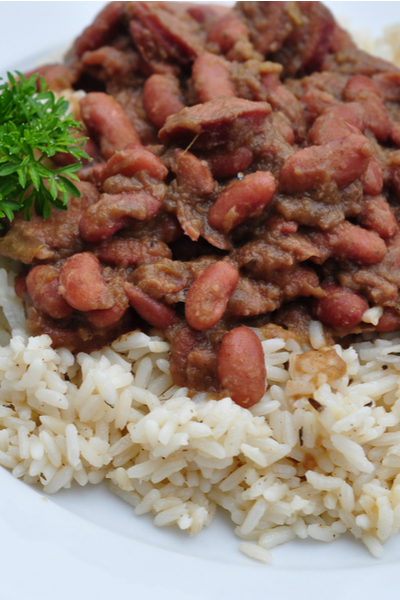 Immediately add the rice to the Instant Pot and cook right after rinsing. That is why it is so important to cook the rice right after rinsing it under cold water. 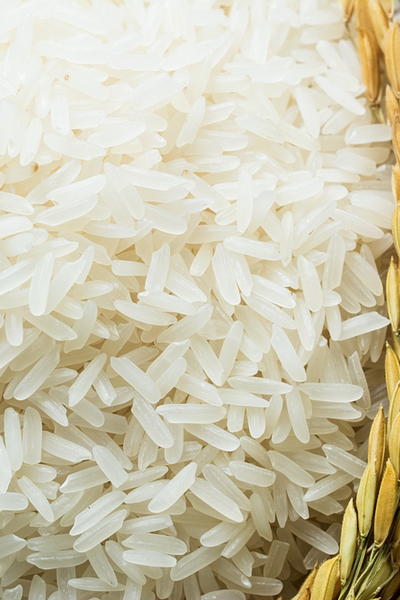 Letting the wet rice sit for too long will produce inconsistent results when cooked. If the water on the top of the rice has time to evaporate it will turn out crunchy. On the contrary, the rice that was in the middle of the strainer will absorb the water and turn out mushy when cooked. That is why it is important to cook it immediately. This is where the big debate is held on how to make Instant Pot White Rice. Perfectly cooked rice that never sticks to the bottom of the pan. In theory, there should be a direct 1:1 water to rice ratio, no matter how much rice you decide to make. Therefore, whether you are making 1 cup of rice or 3 cups, the amount of water needed is equal to the amount of rice used. However, I find that the ratio is based on personal preference. The 1:1 ratio is a good guideline, but it isn’t perfect for everyone. I personally prefer the rice to be a little softer so I had a little more water than the exact ratio. For every cup of rice, I use 1 cup + 2 tablespoons of water. This produces the lightest and fluffiest rice with the best texture in my opinion. And for every cup of water I add, I also add the additional 2 tablespoons of water. Many people add oil to the rice/water mixture in hopes that it will prevent the rice from sticking together. In all of my attempts of making Instant Pot White Rice I have not found a significant difference between using oil and not. I would recommend trying it without at first. If you aren’t satisfied with the texture the next time try it with a little bit of oil. 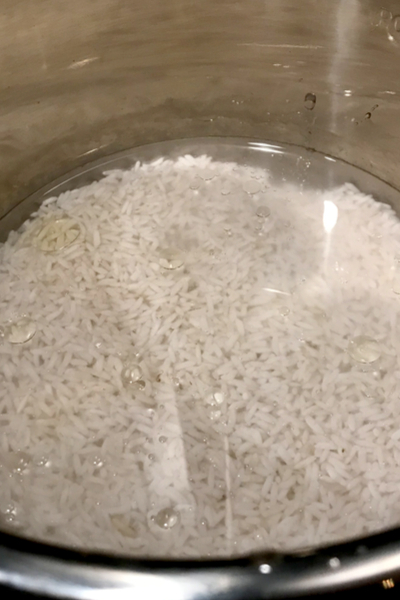 Although the Instant Pot has a Rice Button, I use a different and better method for making white rice. Pressure Cook/Manual on HIGH setting for 4 minutes. After the cooking time expires, allow for 10 minutes of Natural Pressure Release. 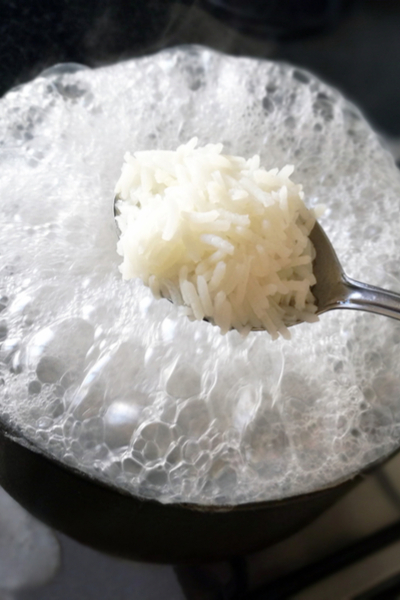 Release any remaining pressure and fluff the rice with a fork. 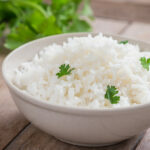 The results – perfectly cooked white rice! Making rice never got easier! 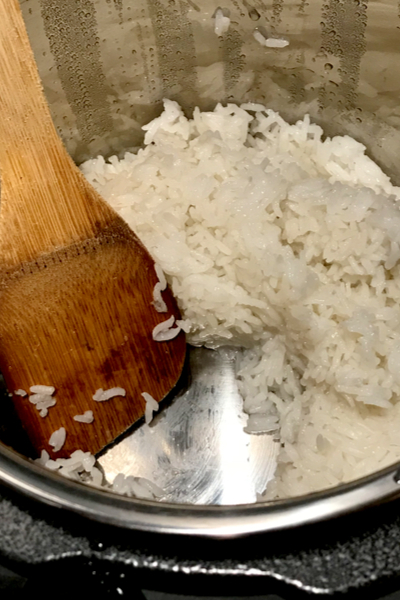 Follow these instructions for light and fluffy, perfectly cooked white rice made right in your Instant Pot Pressure Cooker. Place the rice in a fine mesh strainer. Rinse it with cold water several times, moving the rice around until the water runs clear (3-5 minutes). Immediately add the rinsed rice, water, oil, and salt (if using) directly in the liner of your Instant Pot and stir to combine. Lock lid and set the valve to the SEALING position. Pressure Cook/Manual for 4 minutes. When the timer goes off, allow for 10 minutes of Natural Pressure Release. Quick release any remaining pressure. Fluff rice with a fork and serve.